Those who value and take pride in their appearance have felt the difference a new smile has made in their lives. More than two-thirds of Americans believe an unattractive smile will hinder career advancement (U.S. News & World Report, Feb. 1999)! Porcelain veneers are a cosmetic dentistry technology that is improving smiles and instilling self-confidence in patients. Through a proven specialized technique of veneering, called “smile design,” Dr. Chris Hammond can restore teeth to 100% of their natural strength and beauty, in as few as two visits at his Utah County practice in Provo. Using a scientific process used only by a small group of elite dentists in the country, Dr. Hammond will design a smile with dental veneers to match your individual features and personality. He will take numerous factors into consideration, creating a natural-looking, aesthetic smile. 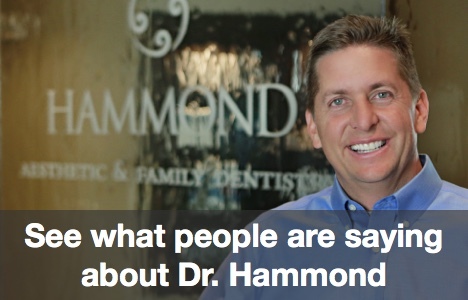 And Dr. Hammond will work very closely with you to make sure that you are ecstatic about the results. If you have any other questions about porcelain veneers, we have a dental veneer website devoted to giving you the information you need about them. Dr. Hammond in the Orem area shows before and after photos and explain treatment with porcelain veneers on The Wellness Hour. In The Wellness Hour interview, Dr. Hammond helped explain some of the misconceptions about porcelain veneers and showed some additional before and after photos of patients who received a brand new smile and a brand new outlook on life with porcelain veneers. You can picture yourself with the smile of your dreams in a no charge-dental veneers consultation with us. Using digital photos of you and your smile we can show you in minutes how porcelain veneers can give you the smile you’ve dreamed of for a lifetime. Dr. Hammond explains the entire process of porcelain veneers from the moment a patient walks into the office until they walk out with a permanent new smile – usually in only about two weeks! We are excited to show you the difference you can achieve in your smile with porcelain veneers…because you deserve it. Call our Provo cosmetic dental practice right now to get started. Patients in Provo, Orem, surrounding communities in Utah County, and beyond trust Dr. Hammond to provide the best care possible with porcelain veneers.